If you know me, you probably know that I am devoted to Palama Settlement and serve on their board. My grandparents, James Arthur and Ragna Helsher Rath, were the first head workers at Palama Settlement back in 1905. My father, Bobby Rath, was born at the Settlement so of course I grew up with a certain level of devotion to this important social agency. One of my dreams for Palama Settlement is to have a sustainable community garden in an unused corner of the campus, adjacent to the freeway. Toward that end, three of us from Palama Settlement visited the fabulous sustainable gardens at Kalani High School last week. Amazing! What was a patch of weeds used for target practice last August is now a sustainable garden that the students are managing as part of their curriculum in a course called Natural Resources. Students are in grades 9 – 12 and are a very mixed group, according to teacher Stephen Kow. They include special education students and a couple of students who are homeless. From what we saw, they are enthusaistic and inspired by the gardens they are growing. These tomatoes are growing out of cinders, and no bugs or pests have eaten them. The gardens initially grew out of furlough Fridays, according to Ken Kajihara, who honchos the program. 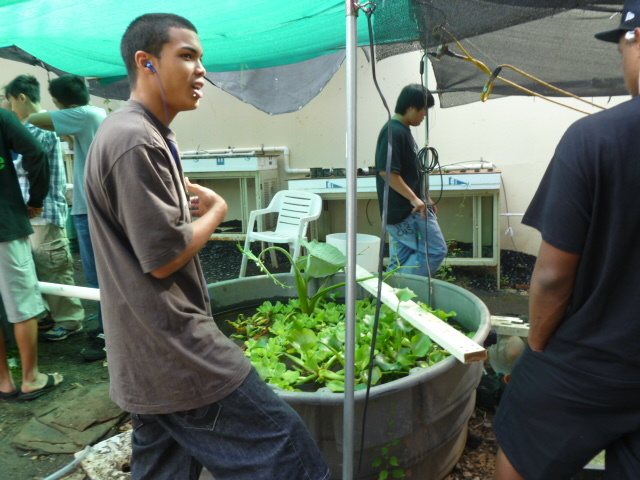 It is part of the students’ environmental studies and is based on the Hawaiian principles and values of ahupua’a. The football and softball teams cleared out the brush and the students landscaped it and planted taro, onions, tomatoes, beans and herbs such as basil and oregano. 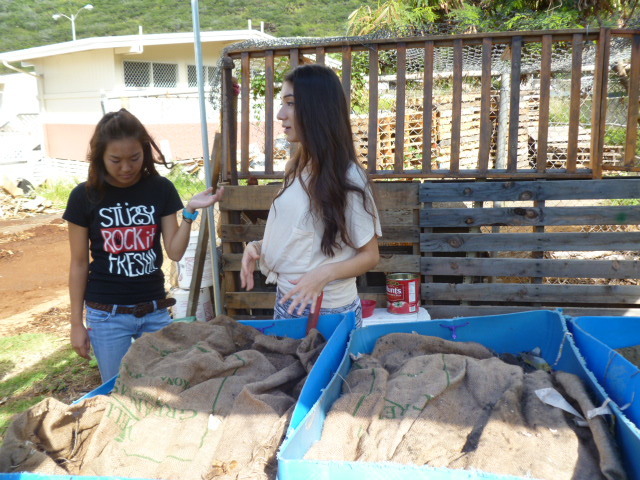 Ramsay Taum of Sustain Hawaii has been a huge help to the school as they have moved forward with the project. He has also helped Palama Settlement see what can be done. You couldn’t ask for a lower impact – and lower cost – project. The palettes were donated by Matson. 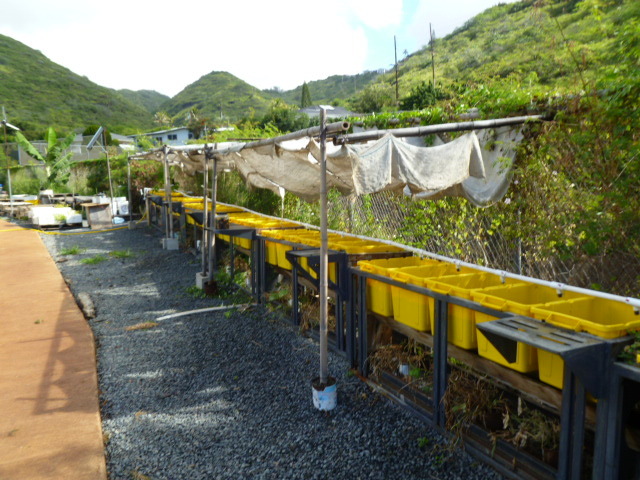 Jack Johnson’s Kokua Hawaii donated the yellow bins for the aquaponics frameworks. They have no need of fertilizer because they have bins of worms that multiply rapidly, as well as plenty of fish poo from the tilapia in tanks. Worms mutiply in these bins under shredded recycled newspapers. Students and teachers are constantly on the lookout for stuff they can use. They took apart a treadmill, for example, and salvaged the motor to build a small windmill. In addition to the gardens, the school runs a little shop for electric vehicle repair. But that’s another story…. 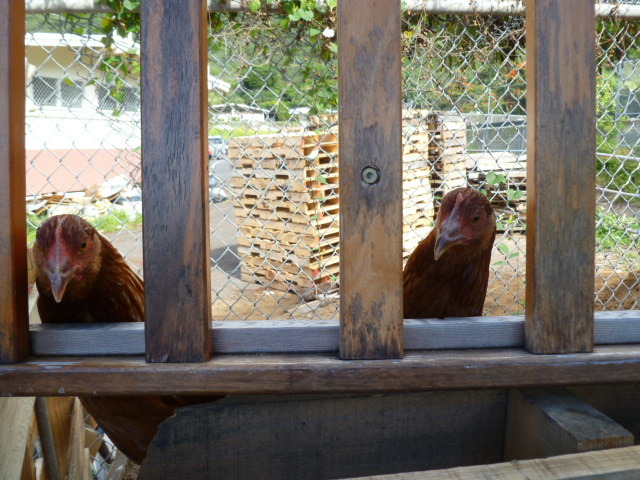 Chickens provide manure, and some amusement, for the students. 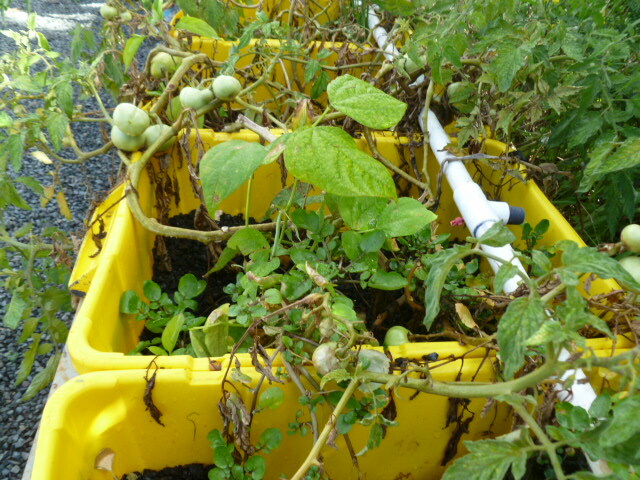 I’m hoping that within a year we may have a sustainable garden at Palama, perhaps being run by students from Farrington. After seeing what they have done at Kalani we all came away inspired.